Image by Gilbert Stuart; antique steel engraving by J. C. Bultre. 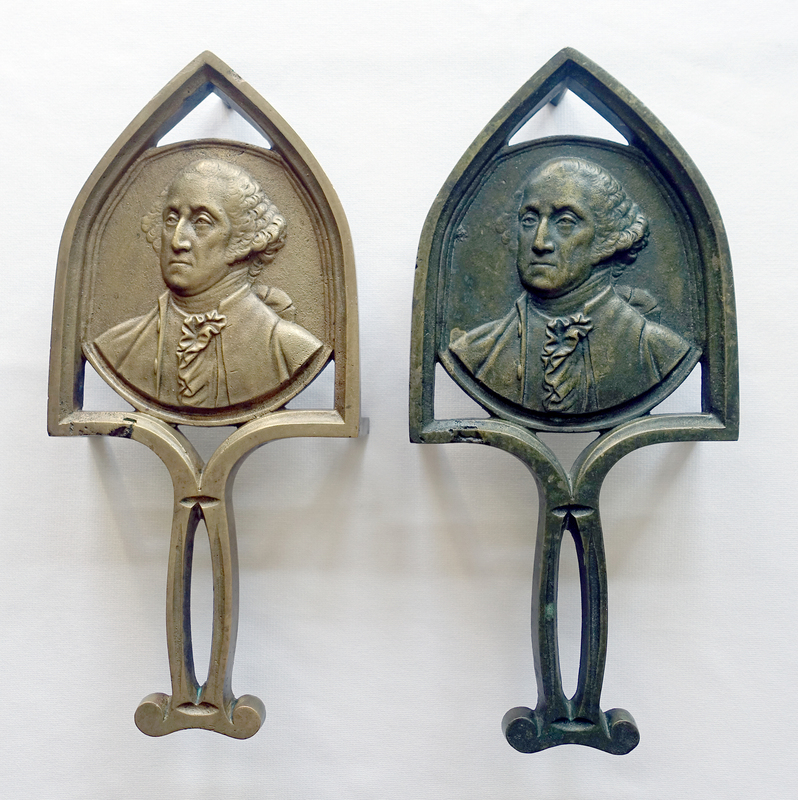 Commemorative brass George Washington trivets were allegedly designed, cast and sold as souvenirs of the Centennial Exposition of 1876, the first World’s Fair held in Philadelphia, Pennsylvania. Washington was an appropriate subject, considering the Exposition celebrated the 100th anniversary of the signing of the Declaration of Independence. 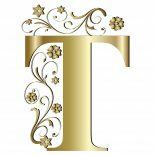 I’d spent years searching for the elusive antique brass George Washington trivet cataloged on page 122 of A Collectors Guide To Trivets & Stands by Kelly & Ellwood (1990). The bust of Washington dominates the center of the trivet, surrounded by an open cathedral railing that extends downward, ending in an open handle. According to Trivets & Stands the wavy appearance of the reverse suggests this pattern was sculpted from either wax or clay. I discovered the auction too late to ask questions or request additional images; but this one auction photo alone was enough to grab my attention. I placed my best bid and ended up the winner! I could hardly wait to receive, unpack and examine the trivets. And they were more than I could have hoped for! Other than a few small surface chips commensurate with age, both trivets were in excellent condition with straight legs, no cracks, and a minimal amount of verdigris. 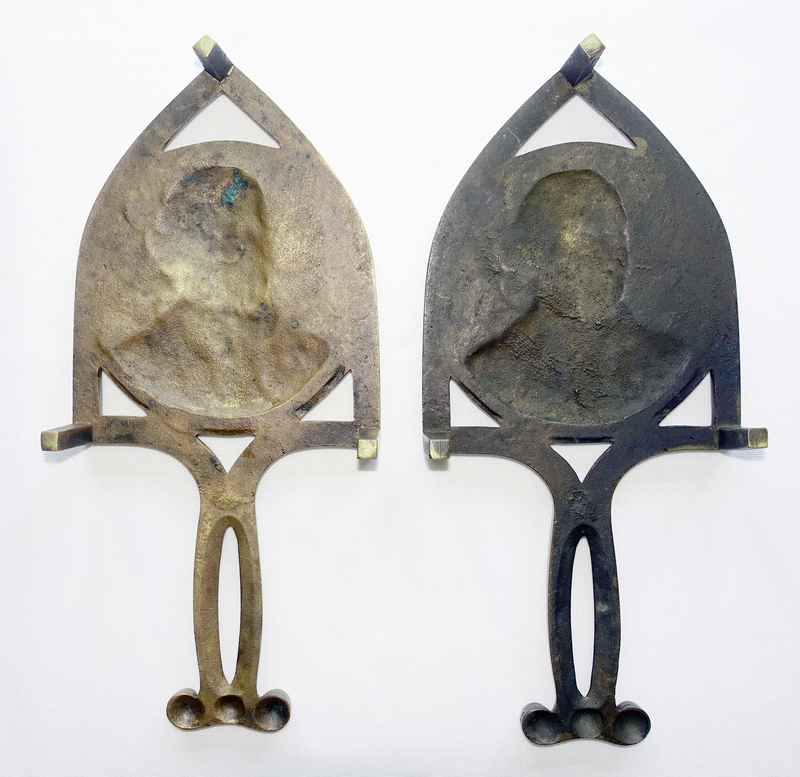 The patina was quite dark, making me wonder if these trivets could actually be bronze instead of brass. (Brass is an alloy of copper and zinc with a muted, dull gold color; bronze is an alloy of copper, combined most often with tin with a reddish-brown color.) If I’d only received one trivet I never would have dared to touch the aged patina. But since I had two I took the opportunity to clean and polish one of them, carefully lifting the finish only enough to verify that it indeed is brass. Here are both trivets; the lighter one is the one I cleaned. My two trivets measure 9 5/8″ x 4 1/2″ with three 1 1/2″ legs. Notice the round sprue (casting) mark on the reverse of each trivet, where the handle meets the stand. And, just as I had hoped, each trivet exhibits that wonderful wavy, putty-like appearance suggesting a sculpted wax or clay mold. And could that possibly be a molder’s fingerprint I see on one of my trivets? Double click on the image below, then look to the right, next to the arrow. It’s the exact size and shape of a fingertip! One last comment … after comparing the coiffure detail on these trivets with the portrait of George Washington, is that a pigtail, a hair bow, or a silk hair bag visible over his shoulder? 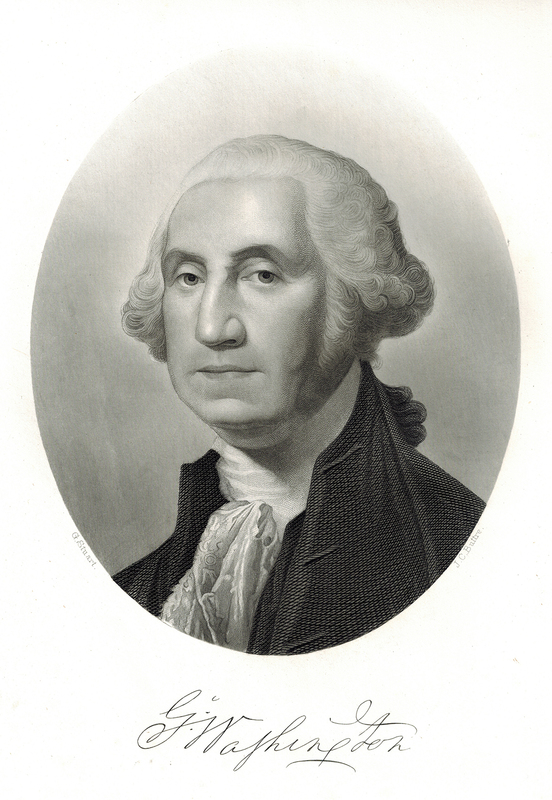 Read the article George Washington’s Oh-So-Mysterious Hair and decide for yourself. 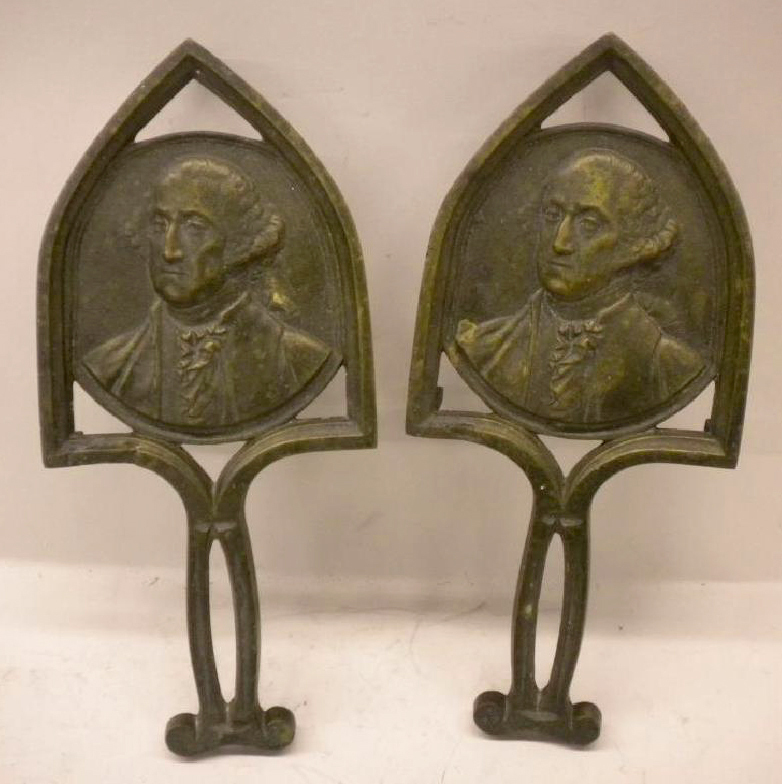 PS: If you’ve been collecting trivets for very long you’ve probably encountered other brass or cast iron versions of the George Washington trivet. 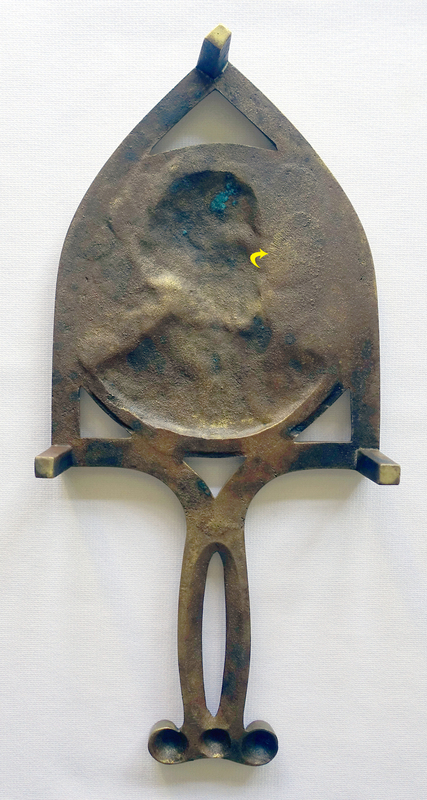 They are later reproductions of this early design and will be discussed in my next blog post. This entry was posted on September 15, 2017 by Lynn Rosack in Antique Trivets & Stands and tagged brass, cast iron, Centennial Exposition of 1876, George Washington.